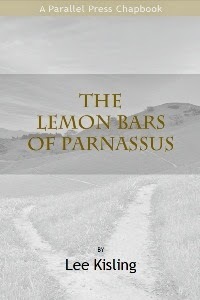 The Lemon Bars of Parnassus. Lee Kisling. Parallel Press. University of Wisconsin-Madison Libraries. Madison, Wisconsin. 2013. The Lemon Bar of Parnassus by Lee Kisling is a travelogue through trailer parks filled with Vernon's and those lost in the sad adoration of Peggy Lee. There are moments of the seriously surreal in these poems as Kisling rhapsodizes over Helen of Troy and skies that rain anvils. These are not distractions, but neon signs that show the way, traffic direction signals for navigating this strange earth. This town is full of owls. It seems unnatural—there being so many. They flew down from the north in search of food. swivel-heads following the delivery boy. the swaying alcoholic and the doubting priest. the immigrant with an unspeakable language. They watch the family in the front room watching nature reruns. and the illumination of radio dials. and the barber sweeping the hair from his floor. There is an owl-dog who follows the mailman. of the houses in this town so full of owls. faded sports glory owls and long story owls. There is a night owl poet with tattered notebooks. call and answer hoots from front porch to widow's walk. can't go home again owls. As I read on, I found Kisling's voice strangely reassuring. His range and choice of song is both esoteric and endearing, ultimately it is familiar in unexpected ways. Where does the picnic rain come from? from leaking pipes, or the sweat of laborers? on Saturday nights in dance halls? from firemen's hoses at burning buildings? or the garden hose spraying the roses? or the last drops from the medicine bottle? Is picnic rain the answered prayers of ants? Does picnic rain lengthen the weeds? on its way to dark underground streams? or the shingles of houses all in a row? for the fair summer days of love? The Parallel Press series of chapbooks published by the University of Wisconsin-Madison Libraries are consistently strong and vibrant choices. The editors have culled, winnowed the chaff, and it shows. Lee Kisling is doing his part. These smart poems have a vibrancy all their own. They tease at the surreal on occasion but that is playful misdirection, the magician making you watch the left hand while the right hand settles the score. to pools and ponds and dishpans. We scan the sky. We look for clouds. tumbling bridges, turning cars into boats. we need the air and water. to pick through the ruin, the ruin of us. shatter the windows, topple the chimney. Lee Kisling, an Iowa native, is an engineer, writer, husband, and father of two who has lived in Hudson, Wisconsin for twenty-five years. In 1992, his first juvenile fiction novel, The Fools’ War, was published by Harper Collins. He has written many songs and poems, plays the piano, and in 2008 had a series of cartoons published in the Wisconsin poetry journal, Free Verse. The poems in this collection are from 2006–2010. He is currently enrolled in the Creative Writing Department at Hamline University in St. Paul, Minnesota.